Located in the gorgeous foothills of the Angeles National Forest, just minutes away from Downtown Los Angeles, La Cañada Flintridge Country Club offers a breathtaking setting for your special event or wedding venue. Spectacular mountain views and skylines, expert and caring professional staff, and food that is far superior to competitors' sets us apart from your ordinary venue. With complimentary parking, rave reviews on social media, and surprisingly competitive rates, LCF Country Club invites you see our venue and meet our expert staff. Your search ends in the tranquil setting that is LCF Country Club. At any time of the year, you will find couples exchanging vows at our romantic outdoor Garden Gazebo or other pool ceremony location. Poolside ceremonies are available depending on availability. We can assist you in expanding your participation and fundraising with customized, one-of-a-kind outings designed to maximize participation, raise more funds, and provide a “Resort for a Day” experience, which includes use of the clubhouse, golf course, seasonal pool and tennis courts. Our competitive menu pricing, tailored to your needs, stands out from the pack–just read our reviews! We have very happy clients, and we look forward to making your event shine too. The Grand Ballroom is the largest and most elegant banquet room at LCFCC. The windows of the Grand Ballroom overlook the golf course and offer views of the San Gabriel Mountains. 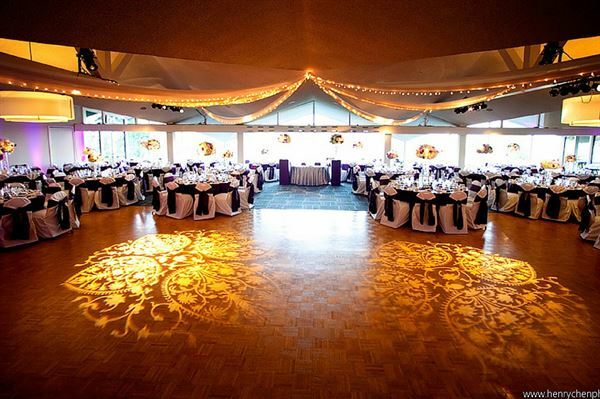 The room can accommodate up to 300 guests with the dance floor and up to 400 without dance floor. The Grand Ballroom can easily be used in conjunction with the adjacent Top of the Tee bar. The LCF Room is graced with floor-to-ceiling wraparound glass windows and an outdoor balcony that offers panoramic views of the golf course and pool along with the Los Angeles and Pasadena skylines. An optional dance floor can be added for any event. The LCF Room can accommodate up to 175 guests with the dance floor and 200 without the dance floor. Atmosphere/Decor: Incredible views and outdoor balcony. Gorgeous panoramic views of San Gabriel Mountains and city skyline. Availability varies. This parking lot is the ideal "Big Sky" location for film, still, or commercial shoots. With panoramic views of the San Gabriel Mountains, Downtown LA, and even Catalina on a clear day, this is an unparalleled site for a wedding or film shoot. Special Features: Incredible, incredible view in every direction! A little imagination, some banquet canopies and this site is beyond magical. The oak-paneled Top o’ the Club has spectacular views of our rolling fairways, tennis and pool facilities, and the Los Angeles and Pasadena skylines. Currently used for member-only fine dining on Friday nights this versatile room can also be easily divided for parties of up to 70 guests. Special Features: Easy, quick drive to all Los Angeles conveniences, yet gorgeous mountain views and setting. Complimentary parking and exceptional food and expert staff set us apart.